If you look carefully, you can find an official day for just about anything. For instance, January 25th was National Irish Coffee Day! 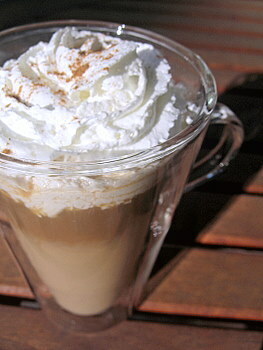 Irish Coffee is a hot coffee drink, where freshly brewed coffee is spiked with enough Irish whiskey to give it a kick, then sweetened with sugar and topped with whipped cream. It is a classic and, although I might be a day late to the official party, any excuse for an Irish Coffee is a good one. Irish coffee is a drink that I like to serve for dessert after a dinner party or even to make for myself on a cold evening when I could use a very cozy, warming drink. I don’t want to offend any purists, but I’ve been known to add a splash of Irish cream to mine, too, just to sweeten things up! I generally go by taste, so as you follow the recipe below, feel free to adjust the amounts to suit your own preferences. Pour hot coffee into a large mug or a tall, Irish coffee glass. Add in whiskey and sugar and stir well. Top mug with lightly sweetened whipped cream and serve immediately.